I have stayed in many beautiful hotel bedrooms in my travels. But none has surpassed room number 141 at the Grand Hotel Continental in Siena. How wonderful it is to be able to report that this handsome city, one of Tuscany’s mediaeval glories, has at last a true luxury hotel right in its heart. Millions of euros have been poured into one of the town’s most elegant palazzi, and the result is an hotel where pilgrims in search of art and architecture can lodge in surroundings of remarkable loveliness. I was, I admit, somewhat nervous as I guided the hire car in the direction of the famous Piazza del Campo. Pedestrians in the central area of Siena know that the internal combustion engine is allowed in these narrow streets and alley-ways only on sufferance. Those on foot have the right of way – and they use it. Still, eventually I found the Piazza Salimbeni and looked around for the object of my search. And there it was: the Palazzo Gori – or, as it is now known, the Grand Hotel Continental. Right on Siena’s most fashionable shopping street, the via Banchi di Sopra, this elegant Classical pile was designed by Giovanni Fontana for the Chigi family in the 17th century. I think the Chigis (who were, clearly, persons of taste and discernment) would like the delicate glass screen, which now protects the vaulted entrance lobby of their former home. I entered through the revolving door. It began to move as I approached – the first evidence of that attention to detail I was to notice many times during my stay. (Its presence makes the difference between a good hotel and a great one – and there is no doubt that the Grand Continental is in the latter category.) Within moments, my motor had been whisked away to be stowed in a private garage nearby. Then a pleasant surprise. A friendly and familiar face appeared. None other than Giampaolo Ottazzi, whom I last encountered at the Villa La Massa, near Florence. Now he is the General Manager here. Little wonder, with this charming and talented gentleman in charge, that my first impression had been so good. My billet was on the first floor, the piano nobile. I looked at the staircase and the wide grandeur of its carved stone tempted me. But age has her disciplines, and I am slave to them all. So it was into the lift – a sparkling box of chrome and glass – for the ascent up the side of the inner courtyard. Thus I arrived at room 141. I walked into its hallway and noticed immediately the umbrella stand (another of those thoughtful details). To my right was the bathroom. To my left was a separate cloakroom, with bidet, wash basin and loo. Both were clad in beige stone. An archway beckoned. Through it, and to the right, was a staircase leading to a galleried seating area, with a sofa and easy chair, a dining table and four chairs and a television and sound system. Downstairs, tall windows with curtains of gold brocade stood either side of a finely proportioned fireplace mantel. Above its brown marble was a large Venetian mirror. 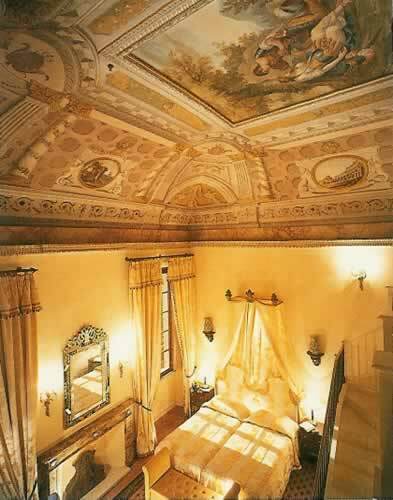 From a stylish pelmet, expensive figured silk swept down to form a dramatic backdrop for the beds. You will have gathered that I liked my sumptuous and comfortable lodgings. But there were yet more delights. The view from the windows was glorious: an urban panorama which can have changed little over the past five centuries – stretching from the black and white striped marble delicacy of the Duomo on the left to the red brick massiveness of the Basilica of San Domenico on the right. And, glimpsed over the tiled roofs between these shrines, were the soft hills of Tuscany. A superb visual treat. Yet the true glory of this apartment was within, not without. For above my head was the frescoed ceiling. Not just any frescoed ceiling, but a riot of trompe l’oeil – with columns, brackets, cornices and capitals combining to produce a rich and satisfying Baroque architectural perspective in paint. At its centre was a framed picture of a young man kneeling to tend a young lady, both in Roman military dress, their helmets tossed aside. Had they fought, not knowing each other’s identity? Were they star-crossed lovers, who had sealed their own tragedy? Now fully restored, this superb decoration and its intriguing centrepiece greeted me as I awoke each morning. Truly, room 141 was the ideal of an Italian hotel room – the sort of chamber of which one dreams but which one never expects to find in reality. And yet here it was. Its cost (940 euros to 1160 euros a night, bed and breakfast for two, according to season) seemed modest – for who can set a price on a dream fulfilled? Later, the dapper Resident Manager, Claudio Piraino, offered to give me a brief tour of the property. Thus I glimpsed the Salone della Feste, a banqueting hall – wherein the trompe l’oeil effects of my ceiling had run amok all over the walls as well. This you must seek out. The wine cellar is worth a look, too: for its 14th century brickwork and its stylish modern fittings. In fact, everything I saw revealed evidence of good taste and lavish expenditure. 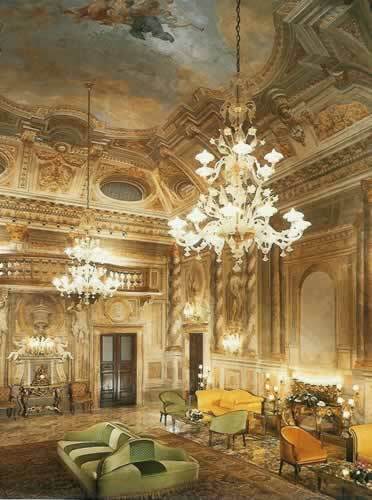 And, although the hotel has only 51 bedrooms, the prevailing sense is of large-scale magnificence. This was certainly true of the setting for dinner. To create the Sapordivino Restaurant, the courtyard has been given a glass cover. 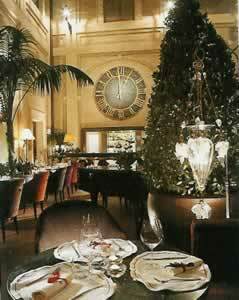 I sat at a marble-topped table and listened to the pianist play (at my request) ‘As time goes by’. Before me were palm trees in giant terra cotta pots. Behind me was a huge clock (rescued, I was told, from the tower of an English church). I looked up and admired the inner windows of the palazzo. Up and down the shiny lift glided in silence. Tiziano, my waiter – smart in his white jacket and black tie – brought me five courses of Chef Roberto Parato’s decently executed Italian food. My opening salad was a real treat, the thinly-sliced, uncooked porcini mushrooms combining superbly with rocket, parmesan and a prosecco emulsion. Thereafter, standards were more ordinary – but still enjoyable. Slices of artichoke terrine came with small pieces of fresh foie gras. Chicken was roasted and stuffed with black truffles. Well-kept cheeses came from the trolley, and the concluding almond parfait was accompanied by flambéed fruit. (73 euros for these dishes.) The wine list offers about 50 of the 400 bottles stored in the cellar – so, if your thoughts turn to the likes of Sassicaia or one of Signor Gaja’s gems, you will need to ask what is available. But my drinking from the list provided was good. A steely white Barolo mixed chardonnay, sauvignon blanc and muscat – the last coming through strongly with a distinctive grapiness (Pafoj Bianco, Icardi, 2000 – 46 euros); and the Primitivo di Manduria showed a typical earthiness and jammy black fruit (Leone de Castris, 2001 – 28 euros). On my tour I had mentioned to Signor Piraino the one fault I had found with my room: the absence of a waste paper bin next to the writing table. I returned from dinner to find the want supplied. Well done, Sir. I pulled the linen sheets close, took a last glance up at my ceiling and sank into sleep a happy man. Breakfast was had in vaulted rooms on the ground floor. Within their warm colours I found myself grateful that Italian hotels of the first quality often have separate, and impressive, breakfast rooms. This facility is rare elsewhere, so I salute the flair and generosity of Italy’s hoteliers. Here, to the stirring strains of Handel’s Water Music, I devoured grapefruit juice, coffee, corn flakes, bacon and fresh pineapple – all of good quality. I could not find any marmalade on the buffet tables, but a word to one of the friendly waitresses and pots with three different varieties from Sicily appeared within half a minute. I did, however, discover for myself some intriguing little cakes, topped with rice pudding. They were quite delicious – so I purloined a couple for later. Eventually, it was time to leave Siena and the wonderful hotel at its very heart. Thank you, the Grand Hotel Continental, for providing me with room 141, one of the most beautiful hotel bedrooms in the world. Via Banchi di Sopra 85, 53100 Siena, Italy.